The jaw-dropping beauty of Badlands National Park draws tourists from all over the world. 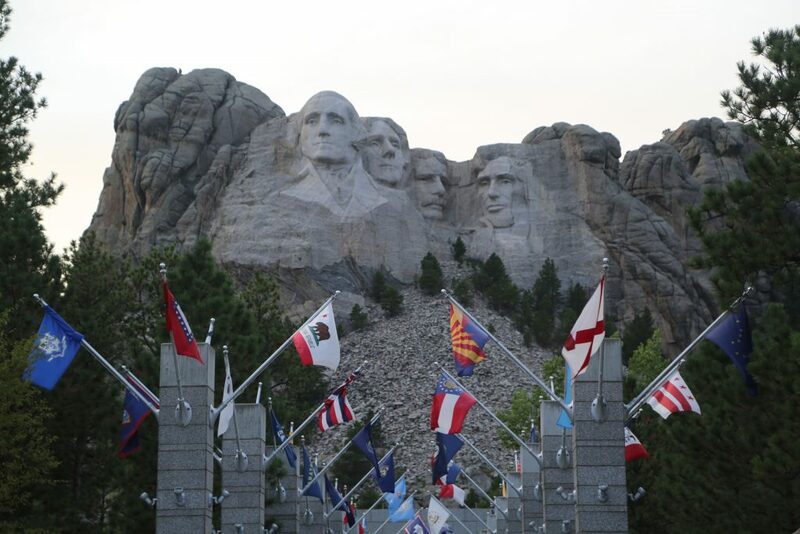 It’s part of the legendary Black Hills area that is filled with parks to discover including Mount Rushmore National Memorial, Jewel Cave National Monument, Wind Cave National Park, Custer State Park, and Crazy Horse Memorial. Throw in iconic towns like Deadwood and Sturgis and you quickly realize there is more to do here than time allows. This is why you need to come prepared and have an idea of what you plan on seeing before you come. 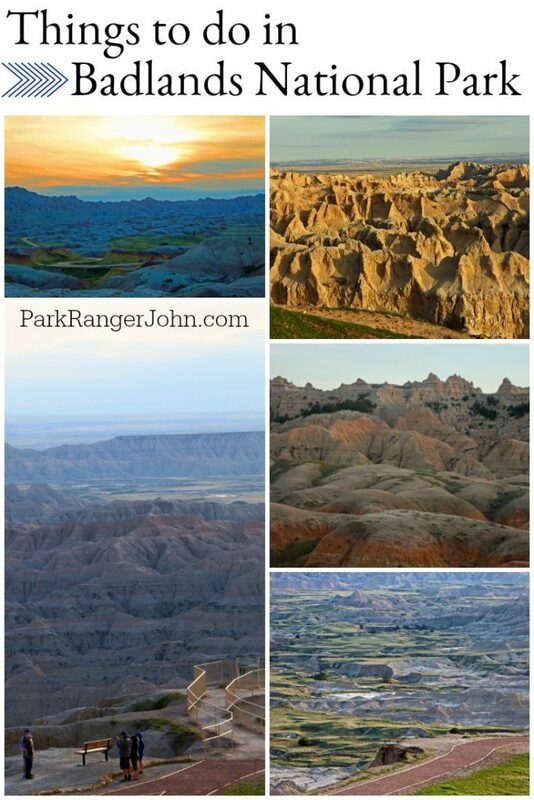 Here is my list of things to do Badlands National Park. The easiest way to explore Badlands National Park is by driving the 27-mile long Badlands Loop Road (Hwy240). This is simply done by taking either exit 131 or exit 110 off Interstate 90 into the park then exiting from the other exit (131 or 110) as you leave the park. This scenic road will take you through some of the most colorful rock formations you can imagine with lush green grasslands in between. You will see one absolutely stunning view after another! Make sure to take in several of the pullouts and just soak in the views! Its as if your soul is being cleansed by nature as you feel the breeze on your skin with the warmth of the sun as you look out to something that seems more like a painting than real life. You can leave the pavement behind and take the Sage Creek Rim Road and see even more of the Badlands. There are a couple really nice viewpoints after leaving the Badlands Loop Road and this is where you will have to opportunity to see Bison. You can continue down the road to Roberts Prarie Dog Town and just watch 100’s of Prarie Dogs! Traveling here will take more time depending on road conditions and the type of vehicle you are driving. Watching sunrise and sunset over the badlands is just breathtaking! The key is to find the right location. Sunrise is really good on the East side of the park just North of the Visitor Center with good viewing locations being the Big Badlands Overlook, the Door Trail, Norbeck Pass Area, Dillon Pass Area, and Panorama Point. Sunsets are better seen at Pinnacles Overlook, Conata Basin Overlook, Bigfoot Pass Picnic Area and Norbeck Pass Area. I have found my favorite photos come before sunrise as the clouds are all light up in shades of red and orange. The same is true for sunsets so stick around at least fifteen minutes after sunset and watch all the colors of the clouds! The Badlands is one of my favorite parks for viewing wildlife! We were all over this park with a camera going crazy taking photos! We saw deer, antelope, bison, bighorn sheep, prairie dogs and more birds than we could count. The best time to see wildlife is in the early morning or late afternoon and found the early morning light to be fantastic and was a perfect time to get out after watching the sunrise. The best part was it was still cool in the morning as we beat the mid 90’s temperatures! 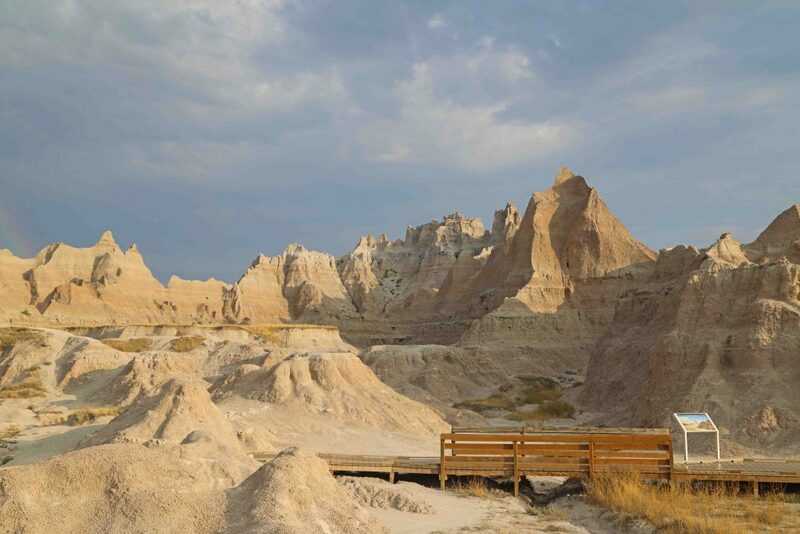 Badlands has several short hikes while others can be 10 miles. I personally opted to take several of the shorter hikes as I had the opportunity to see more of the park and it was 96 degrees outside and shade is a luxury. I would highly recommend the Fossil exhibit trail. This is a short 1/4 mile boardwalk that takes you through fossil replicas and exhibits explaining the history and animals that once lived here. The Castle Rock Trail is a 10-mile loop and passes along several of the Badlands formations with stunning scenery. If you are the adventurous type, go talk with the Ben Reifel Visitor Center and ask about backcountry camping and hiking. Most visitors to Badlands National Park take the scenic Badlands Loop Road. 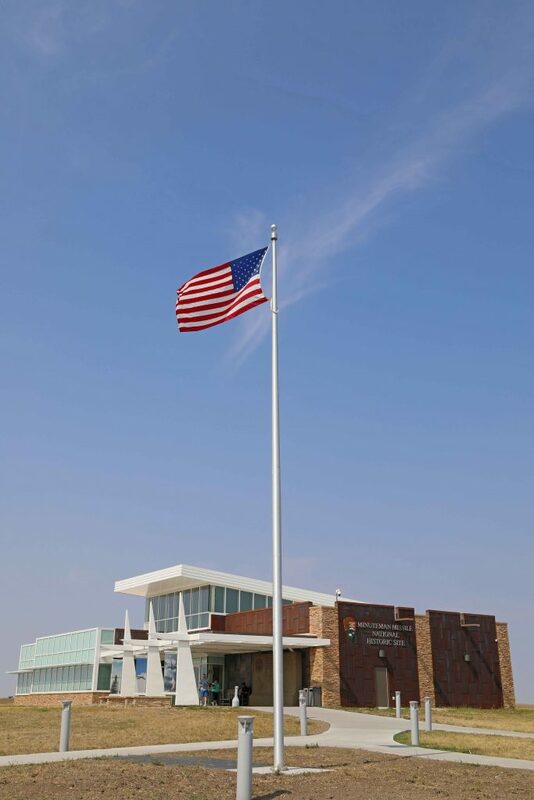 Make sure to stop at the Minuteman Missile National Historic Site when entering/exiting Interstate 90 from exit 131. The visitor center has several displays talking about the cold war era. You may ask why would this story be told here? Did you know there were 100’s of Minuteman Missiles located throughout North & South Dakota? Some were practically right of places like Interstate 90 like the Delta-01 location! Visit my post on Minuteman Missile National Historic Site for more information. 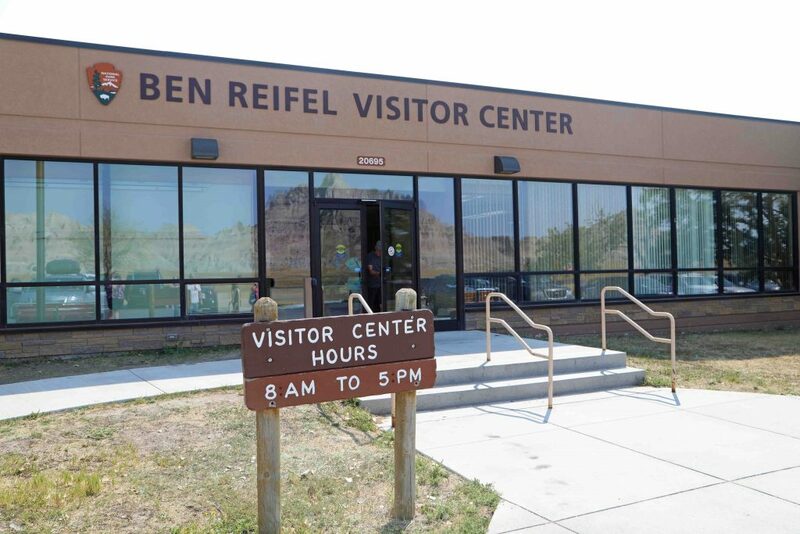 The Ben Reifel Visitor Center is a great stop and will really help you understand the landscape that drives so many tourists here each and every year. It will answer questions about the fossils, why scientists have been coming here since the mid-1800s, what these scientists have found and why there are no dinosaur fossils. It’s time for me to put on my Ranger Hat and tell you about a great man, Ben Reifel, the man the visitor center is named after. Ben was born in 1906 on the Rosebud Reservation to a Brule Sioux Mother and a German American Father. He was one of the first Native Americans to earn a Ph.D. and received it from Harvard! He served in the Army during the Second World War where he returned to spend many years with the BIA (Bureau of Indian Affairs) eventually retiring in 1960. He then became the first Native American to be elected to Congress where he spent 5 terms. Then, at the request from President Gerald Ford, Ben returned to federal service and closed the office of Commissioner of Indian Affairs. 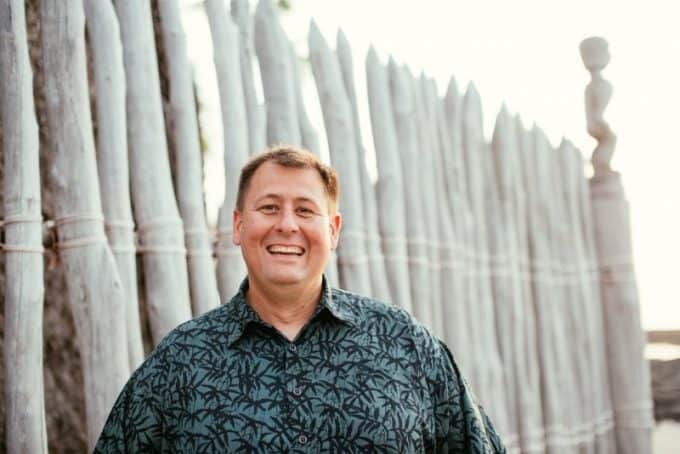 Ben spent his life in public service trying to reduce conflict between Native Americans and Non-Natives. 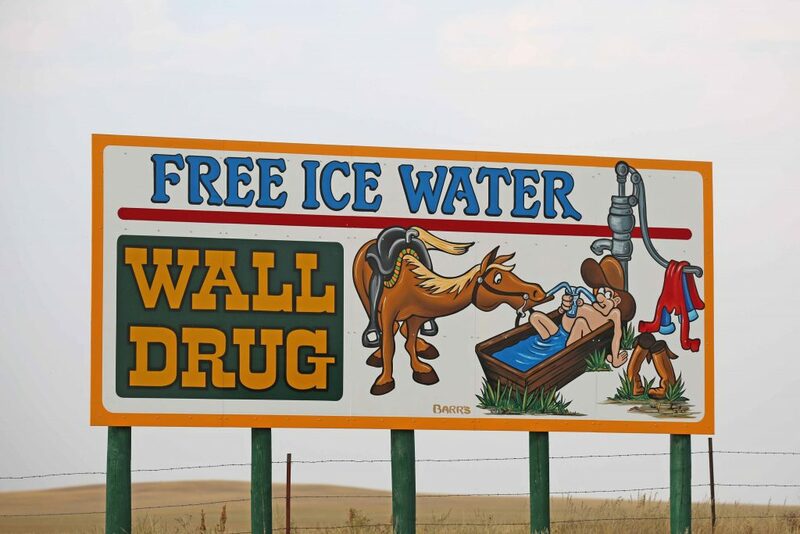 You may be asking why visit Wall Drug? My answer is simple, it’s the tourist thing to do. After all you have most likely seen 100+ signs by the time you get here. Their claim to fame is offering free ice water to visitors and 5 cent coffee. you may already be thinking these signs are some sort of native South Dakota tree by the time you arrive. I did not find anything I couldn’t live without but I did enjoy the ice cream as it was 96 degrees outside, besides I had to get to the Badlands so I could go explore! 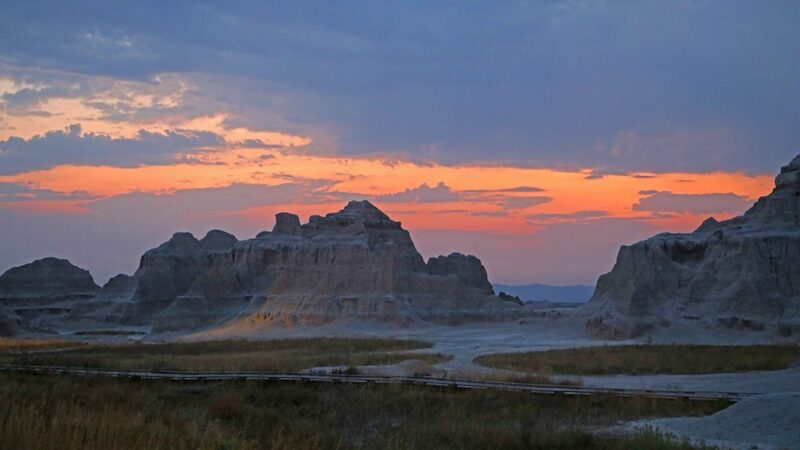 Hopefully, this has you inspired to check out Badlands National Park!